Ronan Hughes, Helen Noud, Joe Barnes, Deirdre Hughes, Deirdre Clarke, Harry Hughes, Margaret O'Malley, Orla Hughes, Rachel Davoren celebrate Portwest's win last weekend. Leading safety clothing and personal protective equipment (PPE ) manufacturers Portwest were announced as Exporter of the Year 2018 at the prestigious Export Industry Awards, which took place on Friday November 16 at a gala event in the Clayton Hotel, Burlington Road, Dublin. This is the premier event recognising achievements of companies working in the export industry in Ireland. Comedian Mario Rosenstock was MC at the black tie event attended by 600 export industry professionals, representatives from over 25 Embassies, diplomats, applicants and awards guests. This is the 18th year of the awards held by The Irish Exporters Association. “We were both surprised and delighted to win this award”, said Harry Hughes, CEO of Portwest, who accepted the award on behalf of the Westport based family business, “It represents exceptional hard work and commitment from our excellent staff worldwide”. This tops off an exceptional year for Portwest where Harry Hughes reached the finals of the Ernst & Young World Entrepreneur of the Year. 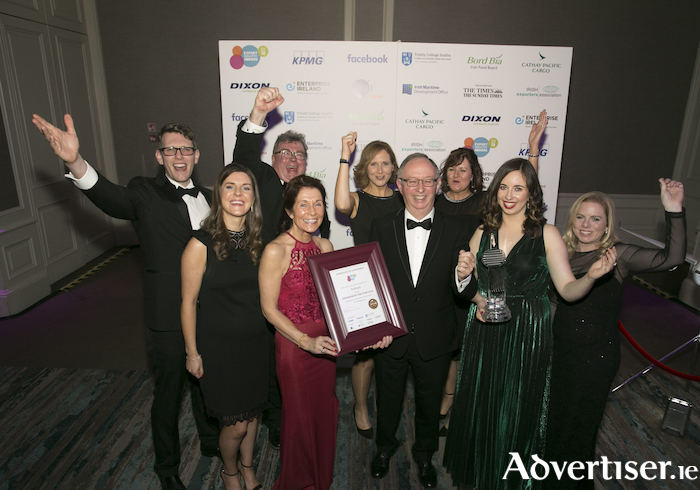 Earlier in the evening Portwest won the multinational category of the awards, beating industry giants Diagio, Glanbia, Irish Distillers and ABP Food Group as well as Chanelle from Galway. This was a remarkable achievement in itself but the icing on the cake was at the end of the ceremony when Portwest were announced as the overall winners, coming out top of no less than 11 category winners. The judges feedback was glowing and said that Portwest is a worthy recipient of the Irish Exporters of the Year 2018 and a home-grown business that retains its core business activity in the West of Ireland. They also said that it is a brilliant story of transformation by an established Irish company into a one with a highly innovative global strategy. Portwest designs, manufactures and distributes personal protective equipment, workwear and outdoor leisurewear sold in more than 130 countries throughout the world. Founded in 1904, the family business is headquartered in Westport and run brothers Cathal, Owen and Harry Hughes. Portwest currently employs over 3,500 staff worldwide. Recently Portwest has pursued a strategy of growth through acquisition and have purchased two Australian workwear companies within the last 18 months. APP Kirrane Auctioneering receives All-Ireland Business Foundation award! Page generated in 0.1634 seconds.